Three years ago, NASCAR driver Ryan Reed was diagnosed with Type 1 diabetes, but it hasn't slowed his rise to stardom. In a brochure, the U.S. Department of Transportation warns of the dangers of driving with diabetes. In the short-term, it cautions, high or low blood glucose levels can cause diabetic drivers to experience dizziness, fatigue, confusion, blurry vision or unconsciousness. The long-term effects can lead to nerve damage, poor eyesight and even amputation of the feet. And while the brochure gives a number of recommendations to ensure that diabetics are able to drive safely, it says nothing about how they should deal with hours inside a car that is well over 100 degrees Fahrenheit without endangering themselves and the drivers around them who are also traveling at 200 miles per hour. In other words, the DOT doesn’t have any advice for NASCAR driver Ryan Reed. 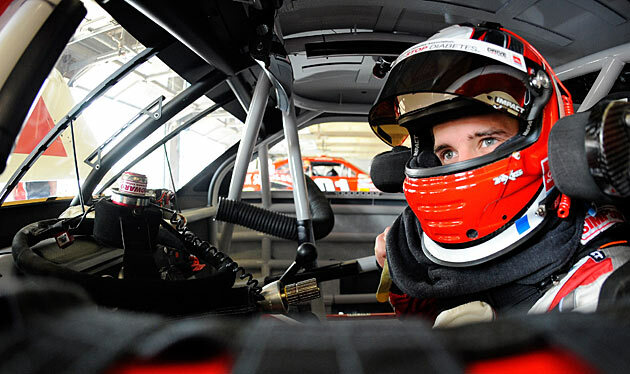 Reed, 20, currently competes in Nationwide Series as the driver of the No. 16 Ford Mustang for Roush Fenway Racing. But three years ago, despite a promising start to his career, Reed was told that his racing days were over. It was February 2011 and he had been diagnosed with Type 1 diabetes. During the weeks leading up to that day, Reed was constantly thirsty. Drinking a two-liter bottle of water wasn’t enough to slake his thirst. His parents noticed that his weight had started to drop, and he frequently had the urge to use the bathroom. Unsure what was wrong, Reed searched WebMD for his symptoms. In a matter of seconds, it was plainly obvious that he was experiencing signs what is also known as juvenile diabetes. Knowing little about the disease, Reed was confused. At the time, he held the popular misconception that diabetes was a disease that mainly afflicted older, often overweight people. But they tend to suffer from Type 2, which is far more common. According to the Centers for Disease Control and Prevention, Type 1 accounts for only five percent of all cases. Reed ignored the signs at first, not wanting to acknowledge the possibility that he might be diabetic. His biggest fear was that the disease would end his racing career, which was looking particularly promising at the time. He'd been the Legends Division Track Champion in 2009, and the 2010 Rookie of the Year in the Super Late Model Division. So when he and his mother, Karla, went to see a doctor, only racing was on his mind. Reed had wanted to be a professional race car driver since he was a young boy inspired by his father, Mark, who competed mostly in NASCAR's Southwest Series, where he won four races. The younger Reed grew up on the track, both as an observer and a competitor in youth events. Becoming a pro was his singular focus. A blood glucose test revealed that Reed's level was significantly high—more than 300 milligrams per deciliter; normal blood sugar levels hover around 70 to 100 mg/dl. The doctor confirmed what Reed had already suspected based on his WebMD search. At the age of 17, he had Type 1 diabetes. Immediately, his mind jumped to his dream. “How is this going to affect my racing?” Reed asked. Without much hesitation, the doctor responded that he needed to live a healthy lifestyle and racing simply wasn’t an option. The dangers of hypoglycemia or hyperglycemia—low and high blood sugar, respectively—occurring while he was behind the wheel were too dangerous. Monitoring his blood sugar level during a race, she argued, wasn’t feasible. Reed wanted to challenge the doctor, but with little knowledge of the disease, he couldn’t and was simply frustrated. His mom was in tears. The next couple weeks were extremely difficult for Reed and his family. Like any Type 1 diabetic, he had to account for the fact that his pancreas, which produces insulin that carries glucose to blood cells, was severely malfunctioning. Type 1 diabetics must give themselves insulin, typically via injection or a pump, but the disease requires a different treatment regimen for each individual case. Even then it can be tough to master the disease. As the body adapts and circumstances change, blood sugar targets are constantly changing. Yet strict management is essential. An appointment with Dr. Anne Peters altered the course of Reed’s life for the second time in less than a month. This time, it was a change for the better. Among the guages on Ryan Reed's dashboard is a blood glucose monitor. Peters has developed a reputation as both a top-notch endocrinologist—the medical specialist that treats diabetes—who is particularly adept at treating diabetic athletes. She rose to prominence after working with Olympic swimmer Gary Hall, Jr., who won three gold medals after he was diagnosed with Type 1 in 1999. Peters also treats Charlie Kimball, a diabetic IndyCar driver. If those athletes could succeed at the highest levels of their sports while still managing their diabetes, perhaps Reed could as well. The Reeds drove more than a hundred miles from Bakersfield to Los Angeles to see Peters, who directs the University of Southern California Clinical Diabetes Program. “I don’t know if this is possible, but this is my dream ... “ Reed started to tell her. Peters cut him off. “If this is really what you want to do, you can do it,” she said. Reed was giddy, but Peters warned him that he wasn’t just going to be able to get behind the wheel and start driving right away. He would have to prove to her that he had mastered his disease and that he had the self-awareness to put safety ahead of competition. One of the main challenges for drivers like Reed or Kimball is that their actions during a race can affect other competitors, meaning that mismanagement of diabetes could lead to disastrous results. Before he started competing, Reed had to understand how his body responded to a variety of triggers that could send his blood sugars spiraling out of control in either direction. Despite the sedentary nature of driving a car, racing requires tremendous physical exertion, which can cause blood sugar to drop. The surge in adrenaline that he experiences during races, however, causes blood sugar to rise. There is also the challenge of managing glucose levels over an extended period of time without being able to check them by taking blood with a prick of the finger. Luckily, Reed is able to use a continuous glucose monitor, which tracks his blood sugars in real time. (The monitor is not quite as accurate as a blood glucose meter, which requires a finger prick, but it does provide a fairly accurate reading of levels and trends.) During races, Reed checks the monitor -- which is on the dashboard -- at minimum of every ten or so laps. If his blood sugar starts dropping too low, he consumes a sugary drink to raise it; if it were to go excessively high, one of his pit crew members—Craig Herrmann Jr., whose main responsibility is tuning engines—is trained to inject Reed with insulin. Reed has not yet required an emergency insulin injection during a race, but Herrmann is confident that he can deliver one in a designated spot on the leg of Reed's fire suit quickly enough to get him back on the track without losing any time. Even so, maintaining stable blood glucose levels for a race is quite challenging. It starts days before the event. Most athletes consume hundreds of grams of carbohydrates before competition to get sufficient glycogen to the muscles, but diabetics have to worry about giving themselves insulin to balance that carbohydrate intake. Consuming more carbohydrates means more insulin. If they administer too much insulin, it can cause hypoglycemia, which causes glycogen to come out of the blood. If a diabetic athlete like Reed finds himself insulin resistant in the days before a race—meaning he is having trouble getting his blood glucose levels to come down—that can also cause problems. Reed aims for his blood sugar to hover around 120 mg/dl when the race starts and for that number to trend up throughout the competition. The young driver was once just a teenage racing prodigy solely focused on racking up victories on the track, but as a diabetic, Reed says he now relishes his impact as a role model, particularly for diabetic kids who are uncertain about the disease’s limitations. And he wants to be known as more than just a diabetic driver.